Hear Us Live on Toginet! Military families are our nation's treasure. Yet, spread around the world, they are not always aware of the great support they have here at home. One of the best ways Military families can learn about organizations such as Operation Gratitude is through radio shows like Military Mom Talk Radio that are available on Itunes and the Internet. Military Mom Radio is a great resource that can be downloaded anywhere and anytime, enabling our military to know they are appreciated and providing the civilian community opportunities to get involved in great causes. "Military Mom Talk Radio is a fantastic “One Stop Shop” of information on subjects particularly focused on Military Mom's. Sandra Beck and Tina Gonzalez have created a “kitchen table” atmosphere that invites women to learn and share important information that supports themselves as well as their military spouses and family members. This forum a super idea as women love to talk so talk radio is a natural!! Their guests cover a wide range of topics and expertise, all focused on Military Families." More.. In Glimpses of Heaven, retired hospice nurse Trudy Harris offered an intimate look at the final days and moments of terminally ill and dying people. Founded by two Army Rangers, the company developed technology to validate military affiliation online in order to empower brands to honor military service through online discounts without fear of fraud. The site has attracted over 80,000 users in five markets since commencing operations in May 2011. Alia Reese, author of children’s hands-on book about dad or mom who is a Marine. Bonnie Latino author of Your Gift To Me, a gripping military love story. Kay Putnam is the founder of the website Successful Military Wife, empowering all spouses to find their career path wherever the military takes them. Lisa Detres talks about faith and prayer to help through deployment. Frank Amalfitano represents Beacon House. Janet Rebhan shares her book Finding Tranquility Base. Brenda Garth talks about the upcoming events for Semper Fi Sisters and Shelly Sellers shares the health benefits of Visalis. March 25 – Authors Mike Gardia of Shadow Commander, Barbara Allen of Front Toward Enemy, Wellness Coach Autumn Arnold. Mike Guardia shares his book Shadow Commander about Donald D. Blackburn of Army Special Forces in Bataan 1942. Barbara Allen shares her story in Front Toward Enemy of how her husband was killed in Iraq in 2005 by a American soldier. Autumn Arnold talks about sugar and addition to sugar and how it impacts weight loss, fitness and health. Searching for Lincoln’s Ghost is a coming of age story set in the mid 1960s. A Passel of Hate is an in depth look at those individuals and families involved in the American Revolutionary War. Forever Growing – A Journey of Trust shows us the author’s individual triumph and reflection on her purpose in life. Dr Bremer addressed managing relationships and how to keep those bonds strong during stress, separation, or even after reintegration. Also, “FAHIM SPEAKS: A Warrior-Actor’s Odyssey from Afghanistan to Hollywood and Back,” co-authored by Professor Moffett and Fahim Fazli, an interpreter Moffett met in Afghanistan. Dr. Phillips discusses worry and stress. We all have it, we all need to handle it. How do we face it and how do we put it in perspective? Plus, Stephen Boyd joins the show to help veterans learn to navigate the VA system, what resources are available and why it’s important for older veterans to go back and register. Melissa Bowersock is an eclectic writer who recently published a book about her aunt who was a nurse in WW2 and a prisoner of war. Her tale is described in Marcia Gates: Angel of Bataan. Driven by the immediate benefit to basic modifications to her daily lifestyle and eating habits, Autumn is challenging others to move forward to better health. Linda Jefferson created a national network of GoArmyHomes Websites to help military families through the rigors of finding housing when relocating to a new Duty Station. As a seasoned REALTOR®, Linda knows from a very personal level, the pressures and problems facing our soldiers and their families, especially when it comes to finding immediate, affordable and comfortable housing. Dr. Kevin Hull, PH.D. Clinical Counseling, is the founder of Hull & Associates, P.A., a private practice specializing in working with children, adolescents, and families. Suzy Manning has dedicated her life to transforming women’s lives. She believes that life is a journey of personal evolution. Every day we have choice to ask powerful questions to overcome limiting beliefs to create the life we deserve. Lisa Detres is a pastor’s wife, writer, and mother of four children who works as an author in Oregon. She is currently writing her first book which deals with helping women get closer to God. Marcella Stretch is president of the facebook networking group Parents of Deployed Service Members. Their next initiative is Valentine Day messages. Steve Boyd joins Military Mom Talk Radio to talk about the resources and benefits of the Veteran Administration and associated medical facilities. Author Donna Lyons brings us 12 Army Wives Give the Best Advice They Never Got is truly an unprecedented look into the lives of 12 real Army wives, including the wives of generals, wounded warriors, dual Army career families and isolated moms. Autumn Arnold returns this year helping us focus on a healthy plan of action for 2013. Carol Stratton, author of Changing Zip Codes with advice for those moving to new communities, Star Johnson, director of the DC Womens Theater Group with their next production featuring military wives. Dwight Zimmerman. president of Military Writer’s Society of America with advice for budding authors. Something for everyone on your gift giving list. Military Fly Moms ~ Sharing Memories, Building Legacies, Inspiring Hope, a biographical collection by Linda Maloney of the inspiring true stories and photographs of seventy women who shared the same two dreams-becoming aviators in the military, and being moms. Margaret Brown shares That Time, That Place, That War: Vietnam. A collection of vernacular specific to the Vietnam era. Dwight Jon Zimmerman shared interesting info about his recent book co-authored with Bill O’Reilly, Lincoln’s Last Days. Adam Stacy described the benefits of CollegiateZone, a college prep and career readiness resource, and within this network, VetQuest providing these service for reintegrating veterans. Gina Sclafani has a blog GinaLeftTheMall.com, meaning it’s time America stop putting material things foremost in their lives and remembering the sacrifices of our military heroes. Margaret Brown is the author of That Time, That Place, That War: Vietnam. This is a glossary of terms, poems, and photos that evolved while teaching an honors program and the Vietnam Veterans of America guest speakers. Author Dwight Jon Zimmerman is the new president of the Military Writers Society of America and shared the back story of his most recent book, Lincoln’s Last Days; a collaboration and young readers’ adaptation of Bill O’Reilly’s book, Killing Lincoln. Dr. Jody Bremer, family therapist discusses the challenges of loneliness and depression during separations. Autumn Arnold shares health and exercise in relation to our mental health, and Marcella Stretch of Parents of Deployed Service Members shares their upcoming PODS Appreciation Day. Sue Pollard shared information about the mission of Operation Gratitude and sending much appreciated packages to deployed troops. She is also a Blue Star and a Gold Star mother, and shares her sons’ service. Debbie Gregory is founder of VAMBOA – Veterans and Military Business Owners Association and MilitaryConnection.com, both invaluable resources to all veterans and military families. Veterans Moving Forward is committed to transforming the lives of physically and mentally challenged veterans, helping them assimilate into society and lead productive and fulfilling lives. Veterans Moving Forward has a unique plan to serve this deserving community – to provide “service” dogs to those who have served our country and who are now in need. Horses4Heroes serves all active duty military personnel, veterans, First Responders and their families. Their growing national network of 190 kid-friendly, family friendly equestrian facilities in 43 states plus Canada provide affordable (sometimes free) recreational, instructional and health & wellness programs for all ages, all riding levels and all disciplines. General Sarge’s mission has grown beyond the Jeffrey’s living room to a website serving hundreds of military families. Weekly and monthly salutes go out to honor military children, the Gift-A-Bear Campaign including the Fallen Hero Bear and Deployment Bear Mascot programs. Operation B.E.A.R. recruits individuals, businesses and organizations to Bring Encouragement And Recognition as sponsors. Additionally, General Sarge’s Families First Campaign partners with the Fresh Wind Ministries to help offset the traveling expense to a family member so they are able to attend the graduation of their troop from Basic Training. Dr. Suzanne Phillips joins us again to talk about filling separation time with quality activities with purpose. Finding purpose eases our hearts, and bridges a separation or even a loss. Additionally the conversation covers why couples disagree about time – how one or the other needs to use their time. Lori Bell of the National Association of Military Moms and Spouses talks about their upcoming Boost Camp, Steve Appelbaum shares the many benefits of a career in animal care, and Dwight Jon Zimmerman begins his tenure as president of the Military Writers Society of America and talks about finding a creative way to share historic events. Debbie Gregory joined us for updates on new fields of study that benefit our military families and children. Joyce Faulkner is the outgoing president of Military Writers Society and shares some of the highlights of the year. Autumn Arnold brings us good tips on staying healthy during the upcoming holidays. Emma Donnelly, author of The Reminder Book, discusses the challenges that people with cognitive decline and traumatic brain injury face, and the comfort that simple affirmations can be such as those found in The Reminder Book. Business coach Bubba Mills talks about preparing for your next career after you complete your military service. Author Janie DeVos’ Janie’s stories teach gentle lessons about love, tolerance and acceptance and appreciation of people’s differences, and recognizing the special gifts that each one of us possesses. Joyce Faulkner of Military Writers Society of America returns to talk about bringing the story out of you – everyone has a story. Celebrate Labor Day with Sandra and Robin as we share music that has great messages for all who work for our country’s freedom. Brenda Garth shares the support of her group across all branches of the military. Marcella Stretch shares information of PODS’ birthday initiatives – every deployed troop should be remembered on their birthday. Autumn Arnold helps us keep focused on our health – even when we’re trying to buy snacks for our kids who are going back to school. Military Mom Talk Radio expressed their condolences to the family of PFC Michael DeMarsico, killed in Afghanistan last week. Joining the show was Debbie Gregory speaking of the resources available at both MilitaryConnection.com and veterans’ business group VAMBOA.org. Also on the show was Linda Jefferson from GoArmyHomes addressing the challenges and resources they offer to assist families facing a PCS relocation. Suzanne Phillips is a licensed Psychologist, Psychoanalyst, Diplomat in Group Psychology, Certified Group Therapist and Fellow in the American Group Psychotherapy Association.She has published nationally and internationally on trauma, couples, uniformed services, bereavement, relationship addiction, etc. Suzanne is author of three books and over twenty articles. Most recently she co-authored, HEALING TOGETHER: A Couple’s Guide to Coping with Trauma and Post-Traumatic Stress. Author Bob Doerr specialized in criminal investigations and counterintelligence gaining significant insight to the worlds of crime, espionage and terrorism in the U.S. Air Force. This background helped develop the fictional plots and characters in his books. ANOTHER COLORADO KILL is the fourth book Doerr has released in the Jim West mystery/thriller series. Bubba Mills of Corcoran Consulting and Coaching will discuss the pros and cons of entrepreneurship and the challenges small business owners face today. Col. Tim Marsano of the Idaho National Guard, is the acting military media liaison for the family of Sgt. Bowe Bergdahl, prisoner of war since June of 2009. Col. Marsano will brief us on challenges families face when their troop is missing in action, and additionally what the role of liaison means. Joyce Faulkner returns this week with another segment of our series, Authors’ Corner. Joyce’s series on Military Mom Talk Radio encourages everyone to look for the story inside them… and write it! Every story is important! Dr. Jody Bremer returns, this time discussing the effects deployment has on the siblings of the troop, and resources for support for the whole family. Live on Toginet every Monday, 5 pm eastern, 2 pm pacific. Marcella Stretch of PODS co-hosts with Robin. Debbie Gregory discusses veteran business owner opportunities. John Rothdiener shares his new book, The Quest for Forgiveness, and Robin introduces Kristen Boyd, military wife of 18 years and followed her husband to his various station points. Terri Sloane discusses the high rate of divorce among military families and working through the process. Author John Nevola shares details of his new book The Last Jump. Harry Liebowitz,founder of the World of Children Award , celebrating and honoring individuals to advocate and change the lives of children around the globe. Harry now devotes all his time to running the World of Children Award – serving as Board Chair and visiting the World of Children Award’s Honorees. Joyce Faulkner returns this week with another segment of our series, Authors’ Corner. Her goal is to help veterans record their piece of history — for themselves, their families, their communities — and our country. Autumn Arnold discusses finding the strength to become more fit while being a single mom. Marcella Stretch of Parents of Deployed Service Members discusses her new concept of matching “Battle Parents” to support each other with children serving similarly, and Joyce Faulkner shares the news of her new book, Windshift. Marcella is the founder of Parents of Deployed Service members Facebook Support Group also known as PODS. PODS provides support to other parents going thru the uncertainty of deployment by sharing information that would make their experience a little smoother. Norma Stratton established Real Estate for Women by Women, and is a guide for all women making financial or investment decisions. Candi Wingate is an award winning nationally recognized child care expert. She has been a nanny, owned a nanny agency, started three online nanny databases, authored “100 Tips for Nannies & Families” and “The Nanny Factor: A Parent’s Guide to Finding the Right Nanny for Your Family,” plus is a wife and mother of two. So when it comes to the nanny industry, she is your expert. Allison Mewes is a proud wife of an Army soldier. Her experiences as a newlywed entering the Army lifestyle, along with the humorous things that happened along the way, inspired her to help other military spouses and significant others make the transition into Army life with her new book Intro to Army Life. Memorial Day tribute includes Lori Bell from nammas.org, author Nancy Kennedy shares her compilation from military chaplains, music by Dani Vitani, David Bell, Kevin Costner, Rushlow Harris, and Billy Ray Cyrus. Linda Maloney, author of Military Fly Moms ~ Sharing Memories, Building Legacies, Inspiring Hope, a biographical collection of the inspiring true stories and photographs of seventy women who shared the same two dreams—becoming aviators in the military, and being moms. Maloney is a retired military aviator and officer and a recipient of numerous military awards. Sally Johnson, RN, talks of her labors of love making quilts for her VA hospital and Wounded Warriors. Dana Whitehead, manager for country singer Dani Vitany, talks of the inception of G.I. Girls – a salute to the women who serve in the military. The show started with Ann-Marie Miller, GS Leader, whose troop participated in making care packages for Moore Mart, an east coast non-profit distributor to military personnel overseas. Debbie Gregory discusses the resources available for veteran business owners through Vamboa.org. Bob Corcoran is a coach who encourages people to become successful entrepreneurs, especially veterans transferring military skills to civilian employment, and Robin introduces her mother-in-law, Jo Boyd, a military mom and a military grandmother. National Association of Military Moms and Spouses is the only network of its kind that brings thousands moms of service members and spouses together in one fun, supportive online community. Clearedjobs.net’s upcoming event expresses appreciation for military spouses who often must endure months apart from their loved ones, uprooted lives, and the general uncertainty that comes with being the spouse of a military member. Joyce Faulkner returns this week with another segment of our series, Authors’ Corner. Michael J. Russer continues his series with Military Mom Talk Radio regarding “Change”. Chris Kerney of MilitaryVetJobs.com shares their suite of services that help companies nationwide connect with Military Veterans. Nancy is the author of Miracles and Moments of Grace which brings together fifty heartfelt and inspiring first-person stories from our nation’s military chaplains. Shining Service Worldwide’s mission is to show appreciation and support to women currently serving in the military, military vets and military spouses. Suzie Manning’s personal intent is to empower women to own their magnificence, to ignite their dreams, and to illuminate their beauty, power, wisdom, and leadership in their Sizzzl years of 50+. Valerie Maine is a doctoral candidate in clinical psychology at Antioch University New England. Her research focuses on the experience of couples coping with post-deployment and post-combat adjustment issues. Dr. Jody Bremer continues to enlighten us on the benefits of counciling, giving us strength and the ability to look ahead, not back. “Eddie and Bingo” is the story of Eddie, who enlisted in the U.S Navy as a combat photographer. He was assigned to an aircraft carrier where he found a lost puppy on the enormous flight deck. Meditec enables military spouses to attend school from the comfort of their own homes and offers the flexibility of choosing their own schedules. Fuzzy Manning is the Founder & CEO of PTS Treatment and the creator of Integrative Trauma Care. Dr. Kelly A. Blasko is Project Manager and Lead Psychologist for the MilitaryKidsConnect.org. Pajama Program, a 501(c)3 not-for-profit organization, provides new new pajamas and new books to children in need, many who are waiting and hoping to be adopted. Dr. Jody Bremer continues to enlighten us on the benefits of counciling, giving us strength and the ability to look ahead, not back. Author Michael Mullins shares his new book “Out of the Mist: Memories of War”, and Joyce Faulkner, president of the Military Writers Society of America, returns for another segment of Authors’ Corner – encouraging everyone to tell their story. Michael Russer continues his series from the Live Outrageously movement, focusing on change. Candace George Thompson shares her soon to be published book about her parents, a military life starting in 1941. Jack Woodville London discusses his love of World War 2 history and the first two books of his trilogy, French Letters. Linda Franklin of Shining Service Worldwide talks about the need for transition homes for women veterans during reintegration. Donna Lewis shares her Competitive Zen book. Music by Mary Lee, Jeff Senour, and Alyssa Gettis. Dr. Jody Bremer gives us insight on endurance, strength and the ability to look ahead, not back. Linda Jefferson shares how GoArmyHomes can support military families in their PCS moves. Debbie Gregory offers a wealth of information and resources to military families on her website MilitaryConnection.com. Janine Wilburn brings us information about Touch-Nology and staying in touch with deployed troops. Nicole Germain discusses an upcoming event for military wives. Joyce Faulkner discusses the potential we all have to author our thoughts and our inner stories. Michael J. Russer is an author, coach and speaker for the Live Outrageously movement. He is going to help military families navigate through change, transition and adjusting to a new normal. Linda Franklin is visiting Military Mom Talk Radio this week to share new initiatives on the horizon for Shining Service Worldwide, specifically for transitioning women veterans. Randy Mixter is the author of Letters From Long Binh: Memoirs of a Military Policeman in Vietnam, based on the letters he wrote home to his wife while an MP in Vietnam. Lori Bell is founder and president of National Association of Military Moms and Spouses, the only network of its kind that brings thousands moms of service members and spouses together in one fun, supportive online community. Authors Ken Farmer and Ben Steinke share their newest novel, Black Eagle Force. Janie Smith is the author of HOPE Beyond Trauma . . . a mother’s journey, and founder of the organization of the same name. Lynette Lovelace, founder of Lifetherapy, aims to encompass the various experiences of life (such as love, hardship, glory, serenity) while arousing the senses and allowing an escape from everyday life. The Scripture-based prayers in Donna Mull’s A Prayer Journey Through Deployment will speak to anyone’s heart with words of encouragement. Leila Levinson is the author of award winning Gated Grief: The Daughter of a GI Concentration Camp Liberator Discovers a Legacy of Trauma. Lisa Detres, a pastor’s wife, discusses women and faith. Author Mary Lee shares her recent story for children, When Grandma’s False Teeth Fly, and Joyce Faulkner presents her continuing Writer’s Corner series, featuring Leila Levinson. Author Sandra Linhart shares her latest children’s books, Daddy’s Boots and Momma’s Boots. John Gorman discusses the US Constitution and its relevance still today. Michael Russer bring light to the process of transitioning jobs. Carol Schultz Vento shares the story of her book The HIdden Legacy of World War II, Stephen Brown discusses his new book ‘Sweeps, and Michael Russer gives an update on the services offered by Go Army Homes and their upcoming cook/military life book. ClearedJobs.Net is a veteran owned company serving the job search and recruiting needs of the security cleared community. Author Robyn Roche-Paull discusses her award-winning book, Breastfeeding In Combat Boots, and Jeff Senour shares the CTS Freedom Rock Experience including clips of songs from his tour. Cellar Angels connects small and family run wineries to a larger audience, and provides assistance to a select group of charities. “The Lady Gangster” is the first-hand account of the USS Fuller, an attack transport ship and its courageous crew of “Chicago Boys” who transformed from wide-eyed new recruits to weathered “Old Salts” braving enemy attacks while delivering troops and supplies during many of the toughest battles waged in the South Pacific during World War II. Joyce Faulkner is president of the Military Writers Society of America. Her recent book In The Shadow of Suribachi, she retells stories inspired by her father of WWII and Iwo Jima. Kathleen Rodgers, member of MWSA, discusses her recent book, The Final Salute, a story about the life of and living with a fighter pilot. December 12 – Suzy Manning of Sizzzl.com helps women become empowered and build their inner strength. Also on the show are Abby Desharnais and Tracey Crain, members of the Manchester NH Central High Marching Band who were invited to perform at the Pearl Harbor 70th anniversary Rememberance Event. December 5 – U.S. Marine Corps Reserve Toys For Tots Program – The mission of the U. S. Marine Corps Reserve Toys for Tots Program is to collect new, unwrapped toys during October, November and December each year, and distribute those toys as Christmas gifts to needy children in the community in which the campaign is conducted. November 14 – Fuzzy Manning of PTS Treatment discusses alternative methodology to treat PST. Visit Fuzzy at www.ptstreatment.com . November 7 – Liz Moore of Go Army Homes and Liz Moore and Associates, providing real estate options to military families, especially with the unique challenges of PCS moves. October 31 – Fuzzy Manning of PTS Treatment and Jody Bremer, Psychotherapist – Fuzzy Manning joins the show to discuss his alternative methodology to treat PST. Visit Fuzzy at http://www.psttreatment.com . Jody received a special certification and verification from the California Association of Marriage and Family Therapists in Working with Military and Their Families In Private Practice. Servicemen from the Marines, Navy, Army and Air Force are a significant specialty, allowing her to provide personalized care for all of the military members and their families struggling with the specific hardships the military incurs, such as long-term separations, deployments, and PTSD. October 24 – Janine Wilburn of Touch-Nology whose company offers pre-assembled correspondence kits, journals, cards and more to keep deployed troops and their families in touch. www.touch-nology.com. October 17 – Laura Garber from Cinderella11pm.com – Cinderella11pm.com is all about bringing magic into women’s everyday lives. It is a blog where they celebrate everyone’s inner princess. Cinderella11pm.com is a place you go to be listened to and appreciated for all of things you do and are! It is about uncovering, discovering and experiencing the magic in everyday life; as well as sharing about the occasional frog that no amount of kissing will turn into a prince. October 10 – Debbie Gregory of Military Connection – Debbie Gregory of MilitaryConnection.com pays a return visit to discuss the many resources of her website, and particularly focuses on the education benefit to veterans that spouses can be eligible for as well. September 26 – Michael J. Russer, CEO of RUSSER Communications and Managing Director for GoArmyHomes LLC is an international speaker, author and columnist about doing business online and virtual outsourcing. He is co-author (along with Christine Durst and Michael Haaren of StaffCentrix) of “Transform Your Business Using Virtual Assistants”, the first book on virtual assistants for the real estate industry. September 19 – We welcome back Pastor Dave Macer of Shepherd of the Hills Antelope Valleywho has done blessings for our troops over the holidays and today he talks about the use of faith in helping families get through deployment. This is a vital show for anyone with children who are struggling with a parent of family member on deployment. August 29 Guests Debbie Nichols and Kristin Houston of Military Children’s Charity which provides gifts and recognition to all children of military personnel. Debbie Nichols is also the author of Deployed: Grandparents Being Grandparents. 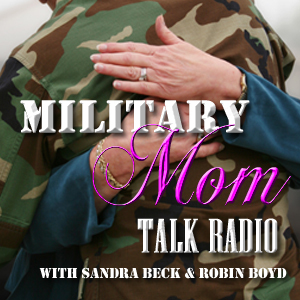 August 22 – Join Sandra and Robin as they welcome Lisa Cypers Kamen to Military Mom Talk Radio. Filmmaker, speaker, author, coach, and now radio talk host on Toginet, Lisa has developed a specialized Harvesting Happiness program for returning military personnel and their families experiencing Post Traumatic Stress Disorder (PTSD) and difficulties reintegrating back to civilian life. The integrated curriculum uses a stigma free multidisciplinary approach to assist soldiers and their loved ones heal to heal the traumas of war and reawaken happiness in their hearts. Harvesting Happiness for Heroes is a 501(c)(3) non-profit organization dedicated to stigma-free assistance of Military Personnel and their loved ones facing challenges with Post Traumatic Stress Disorder (PTSD), Traumatic Brain Injury (TBI) and other post-deployment reintegration issues. Harvesting Happiness for Heroes offers one-on-one services, mini-workshops, and retreats to address the whole person: mind, body, and emotions. This results in a calmer mind, better physical health and reinforces emotional support. Lisa’s program Harvesting Happiness Talk Radio airs live every Wednesday at 9 am pst. on the Toginet network. Learn more about her program at www.hh4heroes.org. August 15 – Mr. Koby J. Langley is the senior adviser for strategic planning and outreach in the Office of Wounded Warrior Care and Transition Policy. In that role, he is responsible for the development of strategic plans related to wounded, ill, injured and transitioning service members and interagency and public/private collaboration. August 8 – Lisa Detres is a pastor’s wife, writer, and mother of four children. Her oldest son, Augustin, is currently serving in the Army and is stationed at Fort Drum, New York. She is currently writing her first which deals with helping women get closer to God. July 25 – Summer vacations usually include a list of books you want to take along to the lake or the beach. Tune in to this podcast to recap three of our recent guests whose books you won’t want to miss. July 18 – Raquel Thiebes has been blogging about military life and everything that goes with it since 2007. Whether you want to know it or not, she’ll tell you about it! She was an Army brat growing up, was a soldier herself and married into the military. She won’t tell you her exact age but suffice it to say that she has 40+ years of experience with all things Army. Her blog is located at Life Lessons of a Military Wife (now in Europe!). She also recently started podcasting and is trying to cover all things military, especially as it pertains to living overseas. Don’t forget she also blogs and podcasts about her travels, so learn from her mistakes and triumphs! She is determined to make your life as a military spouse and an American living overseas that much easier. July 11 – Sandra and Robin welcome Sheri Snively, a Navy chaplain from a pacifist Quaker tradition offers a powerful and surprising account of the human side of the Iraq war. War exposes the divide between who we think we are and how we behave in extreme situations. Sheri Snively has crafted a vivid, unsettling, and ultimately hopeful personal account of the effects of the Iraq war on soldiers and civilians in Heaven in the Midst of Hell. July 4 – Enjoy a musical tribute of some of our favorite American Pride songs. June 27 – Dawn and Candace felt compelled to publish the stories of women grappled with day-to-day issues in Souls of My Sisters: Black Women Break Their Silence, Tell Their Stories, and Heal Their Spirits, a compilation of true life experiences of women of color. In Souls of My Sisters, women from all walks of life candidly reveal how they overcame challenges just like those faced by women every day. June 20 – Sandra and Robin welcome representatives of the DoDEA; Charlie Toth, Deputy Director, and Kathy Facon, Branch Chief, DoDEA Partnership Branch. Department of Defense Education Activity plans, directs, coordinates, and manages pre-kindergarten through 12th grade education programs for Department of Defense (DoD) dependents who would otherwise not have access to a high-quality, public education. June 6 – Military Mom Talk Radio welcomes Trisha LaVoice of Wishes for the Mother’s Heart. Wishes for a Mother’s Heart. With support, devotion and wisdom, the book is a tribute to women of all ages; honoring the significant connections that bond them over the events in their lives. Predicated on Tricia’s collection of original “Wishes,” Barbara responds with pragmatic suggestions to create a more Wishes for a Mother’s Heart is a tribute to women of all ages. For more information visit www.wishesfortheheart.com. May 23 – Jody Bremer is the author of the book, LOOKING FOR THAT LAST FIRST DATE: An Insider’s Guide to Dating After Divorce. Stories, advice, and confirmation that you’re not alone. Visit www.jodybremer.com for more information about the book and Jody’s insight. May 16 -Penny Monetti is author of Called To Serve, a book about military life, being a military spouse, communication before during and after deployment. Linda Franklin is founder of The Real Cougar Woman, a motivational speaker giving women confidence to be their best in Health, Beauty, Relationships, Finance and Spirituality. Her Combat Cougars Bracelet is available through her website www.therealcougarwoman.com and supports women in the military and transitional help for homeless veterans. May 9 – Debbie Gregory of MilitaryConnection.com pays a return visit to discuss the many resources of her website, and particularly focuses on the education benefit to veterans that spouses can be eligible for as well. Visit www.militaryconnection.com. April 18 – Josh Garcia of First Financial Consulting is a strong advocate for his clients and believes the only way for individuals to receive independent, analytical, and unbiased financial advice is with a fee-only advisor that does not work on commission or sell financial products. Having served with the US Air Force, Josh understands some of the unique financial challenges military families may face. April 11 – Sandra and Robin welcome Jody Bremer, recipient of a special certification and verification from the California Association of Marriage and Family Therapists in Working with Military and Their Families In Private Practice. Servicemen from the Marines, Navy, Army and Air Force are a significant specialty, allowing her to provide personalized care for all of the military members and their families struggling with the specific hardships the military incurs, such as long-term separations, deployments, and PTSD. For more information about Jody, visit www.jodybremer.com . March 28 – Liz Moore from Go Army Homes joins Sandra and Robin to discuss PCS moves along with the advantages of using realtors who specialize in military relocations. For more information, visit http://forteustis.goarmyhomes.com. March 21 Sandra and Robin welcome Tish Stropes from the Fisher House Foundation. The Foundation provides support to families of patients receiving care at the nearby medical center and has ensured that families of service men and women wounded in war are not burdened with unnecessary expense during a time of crisis. There is no fee for families to stay at a Fisher House. For more information, visit www.fisherhouse.org. March 7 – Sandra and Robin welcome Andi Grant, founder of Give2TheTroops®. Andi began the organization in 2002 when her husband, U.S Marine Sgt. Brian Grant was called for Operation Iraqi Freedom. The organization sends supplies to troops – anything from board games to golf clubs, exercise equipment or microwaves. Discover how you can help support our troops by visiting www.give2thetroops.org. February 21 – Military Mom Talk Radio sends out a musical tribute to all who work for our freedom. This is a repeat from the Labor Day show. January 31 – Sandra and Robin welcome Cari Johnson, founder of A Dollar To Care – a non profit organization established to support the families of soldiers who are incarcerated for crimes during combat. The organization is not conconing criminal behavior, but realizing the families of these soldiers need support, guidance, and financial assistance during the period of incarceration and trial. For more information, visit www.adollartocare.org, or on Facebook, search “Release Our War Heroes From Incarceration”, the Discussion tab has a wealth of information. January 24 – Film producer Jeff Worthington joins Sandra and Robin to update everyone on the iHistory Project WW2 Project. Open to teens, ages 12-18, the iHistory Project invites students to create a video interviewing a World War 2 veteran. Videos will be submitted to the YouTube contest channel, and winning videos could be included in an upcoming documentary being produced by Jeff. For more information, visit www.ihistoryprojectww2.org. January 10 Show – Sandra and Robin welcomed Melissa Seligman and Chris Piper who have recently collaborated on a children’s book titled A Heart Apart. The book offers military children a vehicle to express their feelings and emotions stemming from a family member being deployed. Melissa also authored a very hear-felt book titled The Day After He Left for Iraq. For details on both ladies, their mission, and their books, visit www.herwarhervoice.com. To order A Heart Apart, visit www.lifecaptured.com. January 3 Show – Sandra and Tina welcome Sue Lynch from There & Back Again, a re-integration program for combat veterans. Because of their combat service abroad, many veterans return home with a myriad of complex emotional issues, including Post-Traumatic Stress Disorder (PTSD). TABA offers a structured program of yoga, meditation and alternative approaches to healing the whole body to help veterans transition back to their lives stateside. Their objective is teach veterans how to use breath awareness, meditation and yoga to manage their symptoms of PTSD, to improve their relationships with loved ones, to begin to fully participate in their lives, and to give back to their fellow veterans through TABA’s Train the Trainer program. Tina’s husband Richard joined the discussion, sharing some of his challenges when he returned home. As a certified yoga instructor, Sue demonstrated with Richard’s help some program components that have been successful and helpful to the program participants. For more infomraiton, visit www.thereandback-again.org. Military Mom Talk Radio is proud to present Higher Ground to its listeners. Higher Ground is an adaptive sports and recreation program serving Veterans with injuries. Hosted in the beautiful mountains of Sun Valley, Idaho, and on the pristine beaches of La Jolla, California, the facility offers most any interests. Higher Ground specialize in serving Veterans with traumatic brain injuries, blindness, visual impairment, PTSD, spinal cord injuries, amputations, and severe burns. It is all completely free for the veteran and spouse to attend! For more information, or how to apply for a program, visit www.hgvets.org. December 6 Show – This week on Military Mom Talk Radio, Sandra and Tina welcome Allessandra Kellerman, founder of Homefront Hugs – an organization dedicated to providing support and comfort to service members, veterans and their families. A national non-profit organization with over 10,000 active members and 50,000 members in all, Homefront Hugs brings a touch of home to soldiers serving all over the world with programs such as Operation Healing Angel, Homefront Welcome Home Hugs, Homefront Hugs for Kids, and Homefront Hugs Hero Adoption. For more information about Homefront Hugs’ services, visit www.homefronthugs.org. November 29 Show – Host Sandra Beck and guest host Robin Boyd welcome Lisa Cypers Kamen to Military Mom Talk Radio for an information-packed hour discussing Lisa’s new program Harvesting Happiness for Heroes. This seminar is aimed to support post-deployment military personnel and their families experiencing Post Traumatic Stress Disorder (PTSD), Traumatic Brain Injury (TBI) and civilian life reintegration challenges. The discussion covers signs and symptoms of PTSD and TBI, and realizing the importance of addressing these symptoms to begin the process of healing. Lisa’s program uses a stigma-free multidisciplinary approach to assist soldiers and their loved ones heal to heal the traumas of war and reawaken happiness in their hearts. November 22 Show – Sandra and Tina host a jam-packed show, featuring guest Janine Wilburn of Touch-Nology, whose company offers pre-assembled correspondence kits, journals, cards and more to keep deployed troops and their families in touch. www.touch-nology.com. The show also includes children’s Thanksgiving greetings to soldiers read by Max Beck Levin, Hannah Holly and Cailin Casas, and a visit from Pastor Dave Macer of Shepherd of the Hills – Antelope Valley, who delivers a prayer of Thanksgiving. November 15 Show – Sandra and Tina are joined by Rick Swanson, segment producer for Military Mom Talk Radio to welcome guest Michael Russer of Go Army Homes, helping military families through the rigors of finding housing when relocating to a new Duty Station. For more information, visit www.goarmyhomes.com. November 8 Show – Host Tina Gonzales is back with Sandra Beck to welcome guest Debbie Gregory, founder of MilitaryConnection.com, one of the most popular websites on the Internet for active military, veterans and their families. It is referred to as “The Go To Site” for jobs, benefits, news, and information regarding resources and benefits. For more information, visit www.militaryconnection.com. November 1 Show – Hosts Sandra Beck and Robin Boyd welcome June Walbert, financial planning expert, Lt. Col. in the Army Reserve, and single mom who shares great insight in giving our kids a sound start in understanding money and financial goals. June is a certified financial planner with USAA, www.usaa.com. October 25 Show – “Because Kids Don’t Come With Manuals” author Tina Nocera joins host Sandra Beck and Robin Boyd for an enlightening discussion about dilemmas parents face and the remarkable website Tina has developed, www.parentalwisdom.com. Experts are on-call to help parents answer any question they are struggling with. October 18 Show – Host Sandra Beck and guest host Robin Boyd share a very informative conversation with Marty Martin of Operation Gratitude, a non-profit organization that provides care packages to troops. Donations are always needed, pitch in to help assemble packages, or contact with the name of a loved one who would appreciate being a recipient. www.opgratitude.com. August 30 Show – Guests Erin Ferucci and Dr. Silene Young join Sandra and Tina. Celebrity life style designer Erin Ferucci brings us ways to brighten our homes no matter where home is at the moment. Dr. Young discusses pet insurance and the benefits of this for military pet owners. August 16 Show – guest host Robin Boyd joins Tina to continue their focus on the Army National Guard by welcoming Dawn Gagnon, volunteer for the NH Army National Guard. Dawn brings us more information about family resources and balancing family life while one’s spouse is deployed. July 26 Show – guest Lauren Flaim, entrepreneur salon owner. At 21 years old, Lauren Flaim is an enthusiastic former teen mom and current business owner of the newly opened Salon Amore in Suffolk, VA. With the success of her salon opening only four months ago, Lauren has become an inspiration to teen moms everywhere. July 19 Show – features guest Beth Russell, director of the Freedom Service Dog program, www.freedomdogs.org . Trainer Patty Mix and program participant Richard Gonzales join the discussion. Freedom Dogs provides Specialty Service Dogs to wounded military heroes at no cost to them. All expenses incurred in the training and health of these very special dogs is covered by Freedom Dogs. The two year customized training of Specialty Service Dogs is quite tedious, time consuming, and costs almost twice that of training a regular service dog. That said, these dogs are just that very special dogs. Through the end of July, Pepsi is taking votes for nominees for a $250,000 grant. To vote for Freedom Dogs, visit www.refresheverything.com. July 5 Show – God Bless America – a reprieve to honor our nation’s birthday. June 28 Show – Director/Producer Jeffrey Worthington is currently coordinating the “iHistory Project: WWII,” a national YouTube competition for high school students (www.iHistoryProjectWW2.org). June 14 Show – guest Andi Hurley, founder of SpouseBUZZ.com hosted by www.military.com. Andi’s blogs share the daily grind of being a military spouse, helping families network, cope, and have resources for anything that military families face. June 7 Show – guest Jody Bremer, marriage and family therapist, discusses the basis of her new book Looking For That Last First Date, available at www.publishamerica.com, as well as her approach to counseling. Tina’s husband Richard also brings information about freedom dogs. For more information, visit www.freedomservicedogs.org. May 31 Memorial Day Reprieve – Military Mom Talk Radio gives thanks to all our troops on Memorial Day; those who are still serving, our veterans, and those who have lost lives defending our freedoms. April 26 Show – guest Michael Hoffman makes a return visit to continue his topics of discussion and valuable resources. April 19 Show – guest Michael Hoffman, Recovery Care Coordinator, USMC, Camp Pendleton, CA. Ladies – please allow me to suggest a topic that could be broken down to several shows. The Department of Veteran Affairs and what is has to offer for every generation of Veterans. As a memeber of the US Army Retired Reserve, 8+ years of AD scattered through out, and now a County Veterans Service Officer (3+ yrs) I am still amazed at the number of young Veterans (AD, NG, Res) who do not know about their options for VA healthcare, how to get & the time limits for the dental care if they did not get it 90 days prior to leaving AD, who can help them wade thru the VA bureacracy if prior service injury flares up, or that even catastrophic civilian injuries could qualify them for some financial support if they have an income below 130% of the poverty level. And you can bet if these young troops don’t know then even more of the WW II Veterans and their surviving spouse know less of what is available to them. I have met and assisted WW II & Korean war Veterans obtain the healthcare, which they had been paying a lot for, and monthly compensation that was due them all along due to their severe wartime frostbite injuries. I have also assisted a WW II widow who was living on less than $460 a monthly due to medical expenses. these are the people who are the very backbone of this country and they seem to be getting lost in the glitz of helping our newest hereos. As a VA rated Veteran, injured in an unavoidable but stupid after duty hours accident, not having been properly counseled because my command didn’t know about the VA, it was 4 years before I even knew to contact the VA. Please help me prevent this type of potential neglect and financial hardship for all our Veterans.